It has been a few months since my last entry and plenty of things have happened, so let’s start where we finished last time! August was a truly great month, it gave me the privilege of working alongside the phenomenal Brigette Faessler as we created a music video for ‘Home’. This was a lot of fun. For those who are waiting for my CD it’s now available to stream on Soundcloud, click here for free listening. 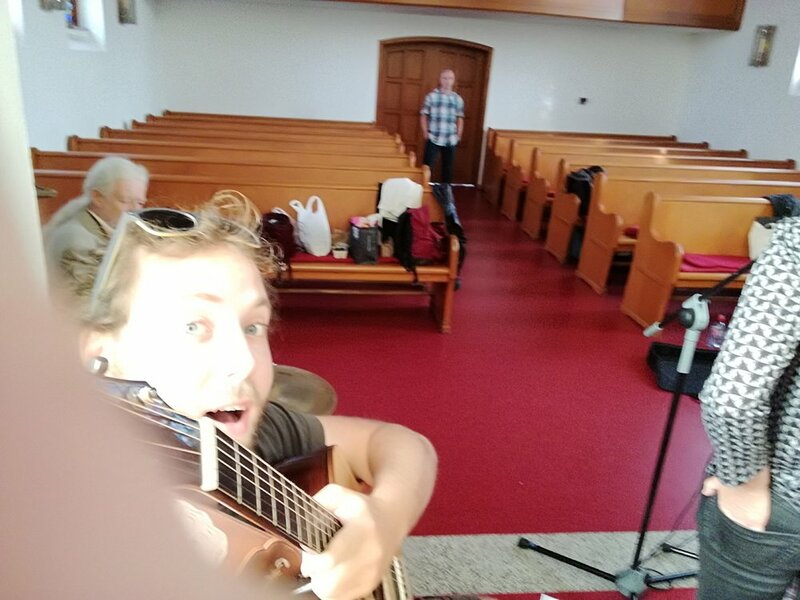 Among various restaurant and bar gigs, I had the pleasure of traveling to the border of Austria and Switzerland once again, to visit the great team at ‘Guitar-Repairs Urs Winkler’ to play for their open house. When it comes to enjoyable performance spaces, it does not get much better then their shop, with incredible guitars covering every inch of wall space there was plenty of inspiration to draw from. For the last week of August I travel to the Netherlands for the first time and hung out at the ‘Django Grappeli’ workshop. This was an inspiring week of non-stop gypsy swing. I had the privilege of meeting and playing with some outstanding musicians such as Sebastien Giniaux, Samson Schmitt and Tim Kliphuis. If you happen to be interested in the gypsy swing style of music, I strongly recommend this camp. Maestro Guitars were conducting their European tour and I was their endorsee for the Manheim Guitar Summit. There, I met a lot of great players such as Magdalena Kowalczyk and Jon Gomm. I did a workshop on the acoustic MainStage and peeped through all the newest guitar related products on the market, it was a good day to be a guitar enthusiast! I explored a little more of the French speaking part of Switzerland, there I met a wonderful builder of Cigar Box Guitars at DB guitars. Daniel, the builder, was great, very welcoming and had a wonderful workshop in which we spoke and played. There was a great merging of guitar related energies for the ‘Knowing the guitar’ workshop. This event was hosted in the beautiful venue of Guitar Repairs and was presented by Hozen, the Master builder of Maestro guitars. I had the very enjoyable pleasure of demonstrating the versatility and playability of 10 different Maestro guitars - it does not get much better than that. I also traveled into Ticino, the Italian speaking part of Switzerland, for the first time to meet with the team at Schertler in their head office. I was given a full tour of their workspace and we discussed the finer points of quality analog acoustic sound together. I learnt a lot and of course tested out a bunch of new gear. The last thing that September brought forward was my first concert in Italy. I traveled to Cremona (north Italy) to represent Schertler at the Cremona Musica. I demonstrated at the Schertler booth and played a slot on the main stage. I loved Italy, maybe a little bit to much, it’s definitely a place I want to spend more time in future. I performed at some very nice events over this month. First, was at ‘Theatre Am Kastelburg’ a beautiful theatre of 120 seats in Waldkirch Germany. Next was the Dreiland Yoga Festival back in Basel, Switzerland. Thanks to the wonderful team at the ‘Swiss foundation for Young Musicians’ I performed on top of Roche Tower in Basel - for those of you who don’t know about this tower, it’s the tallest building in Switzerland. The view from up there is phenomenal, also, it is the HQ for one of the biggest pharmaceutical companies in the world, usually normal ‘plebs’ like me cannot get access into the building. Hanging out on top of Roche tower, in good company! In November was ‘Art of Guitar’ festival at ‘Nellie Nashorn’ in Lorrach Germany, where I was treated to a full house of happy listeners. 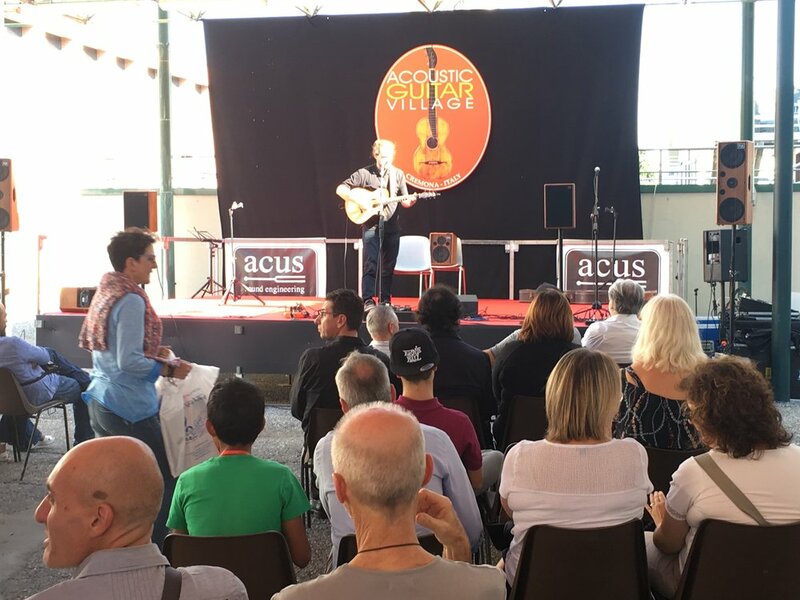 The second was ‘Guitars & More’ expo where I represented ‘Guitar-Repairs Urs Winkler’, demonstrating at their booth and performing on the main stage. While at this guitar exhibition, I met with some of the team from VOVOX and after a trial of their product I am now a proud (and very happy) endorsee of their cables. Check them out! The ‘Guitars and More’ team put together this awesome wee video! The 4th and final instalment of my YouTube ‘office sessions’ experiment is up, feel free to have a look and listen here, if you have not, please consider subscribing to my channel! Lastly, I had a great chat with Aaron from the New Zealand radio station Tuwharetoa FM. We spoke a lot about music and some of my recent projects in Europe. It was very heartwarming talking to a kiwi again, feel free to have a listen by clicking here. That pretty much sums up the last few months for me. Now that 2018 has come to an end, I am turning my focus and energies to new year. I am excited as there are some great projects in the preparation phases and still so much music to explore, learn and share. The last two months have been spent on the road in New Zealand for the first release tour of my new CD ‘Home’. What a set of rewarding and intensive months they were! After 30 hours of travel and a few days of rest to get over the jet lag things kicked off with a bang at the TSB Festival Of Lights in New Plymouth. From there it was a blur of driving, shows, workshops, the occasional radio interview and of course all the incredible scenery and blue oceans I could ask for. During my time in New Zealand I played 40 concerts from Auckland and as far south as Oamaru. The journey took just over 7,500 kilometres and has been the muse for a bunch more compositions.. The next CD is well on the way! All the hosts of the house concert series. A huge thanks to 'Maestro Guitars' for my guitar (which handled its first tour brilliantly! ), 'Guitar-Repairs Urs Winkler' for the fantastic guitar set up (the action is still spot on! ), 'RightOn Straps' for a sturdy and stylish strap and to keep my guitar safe! A banner for the tour made by the incredible James Fitzgerald. The tour was by all means a success, even if it was a little tiring. Now I am back in Switzerland preparing for more concerts, collaborations, compositions and new goals all for the coming year. To start where I left off, the end of October - Bremen!! It was a fantastic time, during the week I was there I gave a concert and workshop at the Bremen HFK. The concert had a full audience and the workshop gave me the opportunity to meet some incredible classical players. 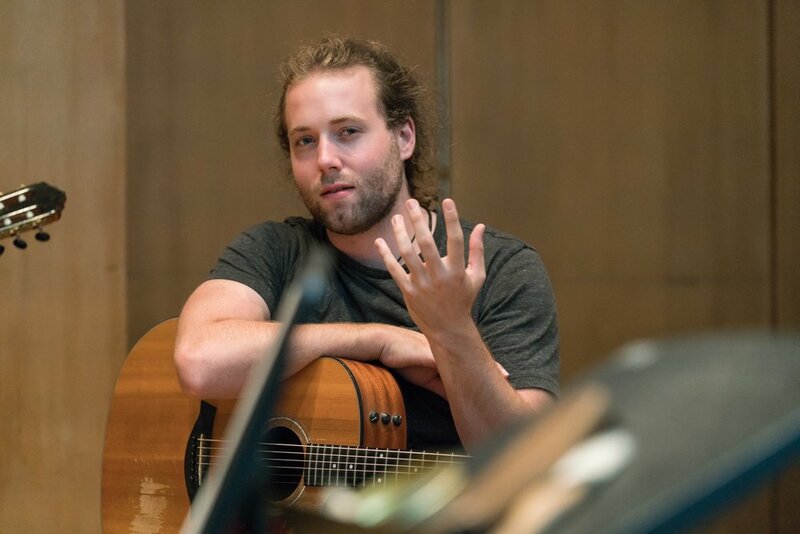 I was lucky enough to be hosted by Andreas Lieberg, Classical guitarist extraordinaire, we spent many evenings together discussing the finer points of technique and interpretation. I learnt a lot from him about the Classical approach, philosophies and the historical context of Tango! - Thank you Andreas! This visit gave me great new idea’s for future repertoire. November also gave me the opportunity to play with a new band! Walti Huber and the Jetsam 5. Both concerts where great - sold out shows, beautiful venues and great musicians. One of the highlights with them was performing along side 11 other musicians during their CD release show in Lörrach, Germany. In these last months I have also had the pleasure of playing on a regular basis with the gents from Klischee, in particular lead singer and showman William which has been a great creative outlet! New things on the way.. I went along to the Guitars & More expo and sat at the booth of my good friends ‘Guitar-Repairs Urs Winkler’ and was introduced properly to Maestro Guitars, this is where I fell completely in love. Ladies and gentlemen, what an incredible make of guitars! Aesthetically, feel, neck, set up, sound, responsiveness, versatility - this guitar has it all, so after a little help from the ‘Guitar-Repairs Urs Winkler’ team I became a very appreciative ambassador for Maestro Guitars!! During this year I also had the huge pleasure of playing and working along side the incredible 'Celine Huber' on a regular basis. December saw us perform our first series of shows. Thank you Celine for all of the music! More to come in 2018! 2017 was a such a great year for so many reasons. I went on 3 tours, performed 63 shows, played concerts with 7 different bands though out the last 12 months. 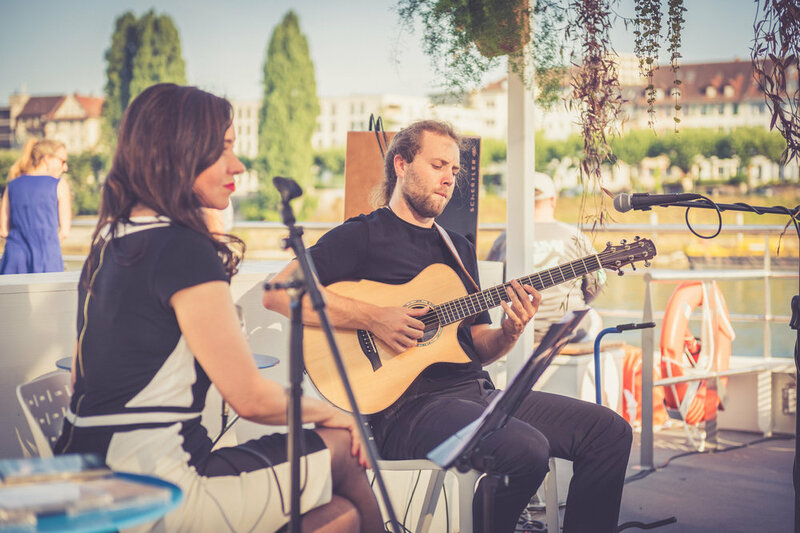 I performed in Switzerland, Germany, France, U.K, Luxembourg and Spain, created a CD, became an official ambassador for Maestro Guitars (Singapore), Guitar-Repairs Urs Winkler (Switzerland), Right!OnStraps (Spain) and Schertler Acoustics (Switzerland). Looking back, some of the biggest highlights of this time was meeting many new dedicated musicians. They have given me a consistent source of inspiration to improve and work hard. So from me to you - Thank you!!! Now, onto 2018 - Next year will kick off with a bang! I travel back to New Zealand for a tour through out the country. I cannot wait to re-connect with old friends and fantastic musicians over there!! - But more to come on this a little later. So for now - Have a great start to your new year. Picking up my new Maestro Guitar from Urs Winkler himself! This Guitar Shop in Bremen had my poster! Concert in the Studio of Samuel Buri. Taking a bow with Walit Huber & The Jetsam! Since my last update it has been busy! I went to Freudenberg, Germany (right on the border to Luxembourg!) and stayed with some good friends while I recorded my first CD! What an experience! The team at LEICO Studio's were fantastic, welcoming, fun and professional to work with. My friends with whom I stayed with also happened to have a guitar collection of 150 acoustic, electric and jazz top guitars.. As hard as I tried I could not play them all. Once I returned back to Switzerland from my CD recording I went straight into preparing for the ZeitRaume Basel Architecture and Contemporary Music Festival. I performed twice, once to open the festival and again in the evening of the second day. I performed on behalf of the fantastic team at the Swiss Foundation For Young Musicians. The whole festival was just plain awesome. During the opening ceremony they lifted (by crane!) a grand piano 100 metres into the air to place it where the concerts would take place! I had the challenge and privilege of providing music for the lift. The second performance was in the glass room on top of the Sudhaus Warteck (for those of you who don't live in Basel, its a very tall tower that over looks the whole of Basel, beautiful!). The concert was great, intimate and acoustic. The following week I went to the Music-Akademie in Basel and hung out with the amazing Fred Frith for a two hour long improv workshop. He blew me away with his approach to improvising and musical ideas. Needless to say I went home and practiced very hard afterwards. In the last week of September I was lucky enough to perform at the prestigious Basel Plucks Festival for the closing apero of the event. I was lucky enough to meet up with the lads from Klischee, one of Switzerlands biggest and best electro swing bands. We traveled together to Zurich and crashed the office of Watson with a small impromptu concert, it was a great laugh and fantastic to play some gypsy swing! After this I traveled back to Basel to play a show with the gents at Xipenda, for a few hours of afro cuban grooving! This now brings us to today!! With plenty of rehearsals coming it means there are plenty of gigs coming up to! The next concert will take place in Bremen, Germany at the Musik Akademie fur Alt Musik, where I shall perform a concert and host a 4 hour guitar clinic. My co-producer and host for the week! My accommodation in Germany while recording.. Tough view. Festival opening. The piano begins to lift! The Piano is now properly flying..
Discussing improv with Fred Frith. Post gig picture with the gentlemen from Xipenda. A lot has happened since my last update! I have just returned from the Zarek and Albi 2017 European tour - What a great tour! Albi and I were shown great hospitality everywhere we went and it was my first time playing in a lot of these places. While the whole tour was incredible I have to say an off stage highlight was the fathers day celebration in Bremen, Germany where Albi and I were shown the cultural tradition of the fathers day race - Recommended for any traveler's headed that way! So, now that I have returned back to Switzerland my focus has changed back to more local gigs. I have some cool videos that will be finished soon and some regular concerts coming in the next few weeks also. The summer looks to be a great time and there are plenty of announcements to come. So this is the very first blog entry for my website. I will begin doing monthly updates so you can keep up to date with the interesting things happening! So, I am excited to announce the very first 'Zarek and Albi' tour through Europe that will be happening in May 2017. I will be joined by my dear friend (and phenomenal singer) Albi from the New Zealand band Albi and the Wolves. He will travel from New Zealand to Basel and we shall commence on a 12 show tour, playing in Switzerland, Germany, and the U.K.
We will be performing the shows under the name of 'Zarek and Albi' and be posting regular updates so you can keep a tab on our adventures! The events to these shows are here!